Help Noah match pairs of animals before the flood waters reach the ark. Click on the sides of the cubes to reveal the animals. The cards will flip back over if you don't find a match. 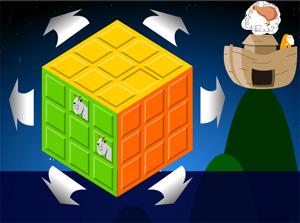 Click on the arrows to rotate the cube - the animal you're looking for may be on a hidden side! None! It plays in your browser! Flash Rools! 3D Studio Max and origami were actually used! Ryan animated the cube in Max and rotated/skewed square movieclips in Flash to match the 3d animation. He folded and labelled an origami waterbomb model to help visualize the programming for the cube faces. Awesome. WOW. 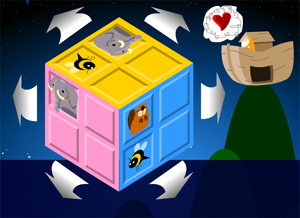 A FUN memory game with a Rubik cube twist and incredible production values. 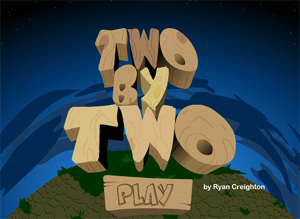 One of the best looking and best playing games created at TOJam #2. The integrated Noah's ark theme is a stroke of genius - I'll need to consult my local bible for more game ideas.